A reader sent me the following link and I just have to share it. The conspiracy theory that inflation is being wildly under-reported doesn't withstand more than 30 seconds of scrutiny. So why the persistent belief that we're reliving the stagflationary nightmare of the 1970s when the deflationary nightmare of the 1930s is much more relevant? I have stagflationary in my name and even I don't see stagflation. Of all people, you'd think I would be the most sympathetic to the conspiracy theory. 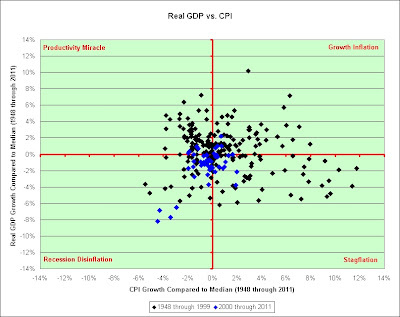 I do see pathetic real growth, pathetic real yields, and pathetic job creation but I don't see runaway inflation. I track every penny I spend. It's just not there. As a keeper of receipts, I offer this anecdotal data point. I refer you to the sticker that was mounted to my Camry 4-Door XLE Sedan V6. In order to compare apples to apples I will remove all of the optional equipment. Let's ignore quality improvements (note the larger engine on the new model) for a moment and just talk about the 19.2% price increase spread out over 16 full years. 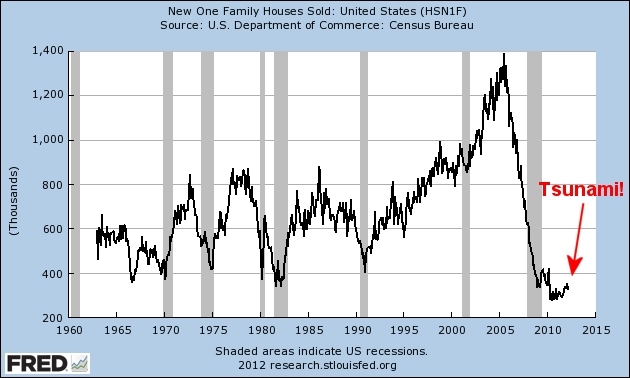 That's an average price increase of 1.1% per year on a large purchase that most Americans very much seem to cherish. 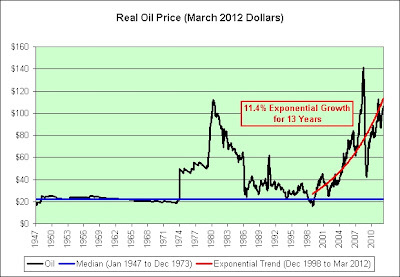 Now let's talk about what the price would be if inflation had really been 10% per year. So here's my question for the CPI conspiracy theorists. How many Camrys would Toyota sell this year in America if they raised the price to $115,048? Now let's see what the government says new car prices have done. In April 1996 (the month I bought my car), the new car index was 140.8. 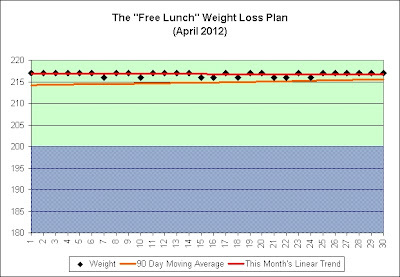 As of March 2012, it stands at 143.702. That's an average annual increase of 0.1% per year. At best, the government is under-reporting new car inflation by 1% (the difference between the 1.1% I see and the 0.1% the government sees). That hardly gets you to 10% inflation though. 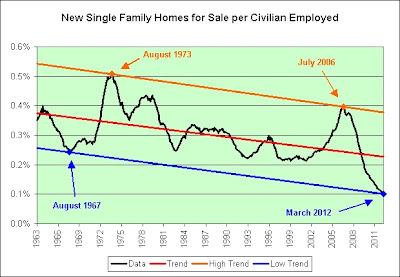 Would anyone really dispute that new cars of today haven't gotten better by the 1% per year the government seems to be claiming? Seriously? Let's go back to that engine discrepancy. My car has a 3.0 liter V6 185 horsepower engine. The new car has a 3.5 liter V6 268 horsepower engine. For those keeping track at home, that's a 45% increase in horsepower. Amazing. The government claims that I should have to pay more for a more powerful engine. Why would I disagree? I paid extra to get the V6. It was worth it to me. That's just for starters. I don't think it is hard to imagine other improvements that have been made in the last 16 years. The 2012 XLE V4 has 178 horsepower, which is just 7 horsepower shy of my 1996 XLE V6. It gets 25% better gas mileage in the city than mine too. Further, its MSRP ($24,725) is lower than what I paid 16 years ago. So you tell me where the inflation is in new car prices and we'll both know. It isn't inflation if you get a 20% better car for 20% more money. In fact, we do that every time we purchase a car. "I like this one but that one is 20% better. Should I pay 20% more for it?" It's not always an easy decision. It stinks if you cannot afford the new car with added features and improvements, but that's not an inflation problem. That's a wage problem. Let's stick to what the problem really is. For a variety of reasons, wages are stagnating. It's not stagflation. It's stagployment. In my opinion, we're going to be stuck with it for a very, very long time. Sigh. Last year I posted the following chart and offered some thoughts to go with it. Here's an updated chart that includes 2011's results. 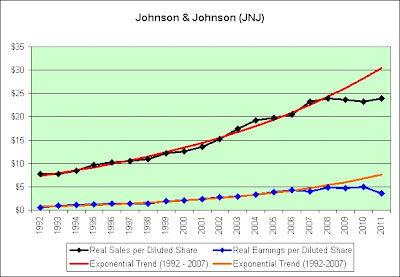 Note that I've added an exponential trend line for real earnings per share. 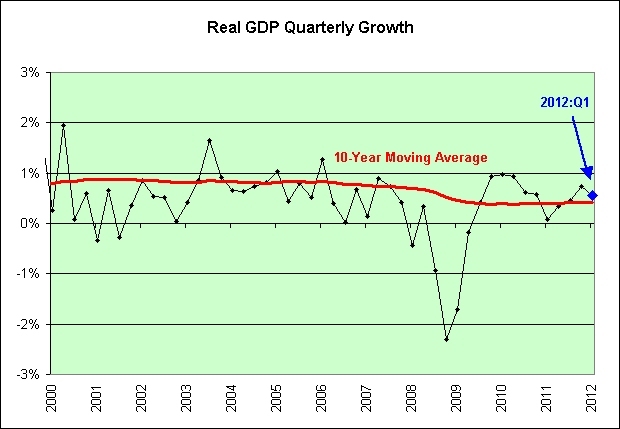 Are those the trends you'd like to see during a supposed economic recovery? Perhaps they come up with a cure for cancer. There's no doubt that would make the company a spectacular investment. Perhaps they have similarly wonderful things in their pipeline that an investor with time on his/her hands could explore. 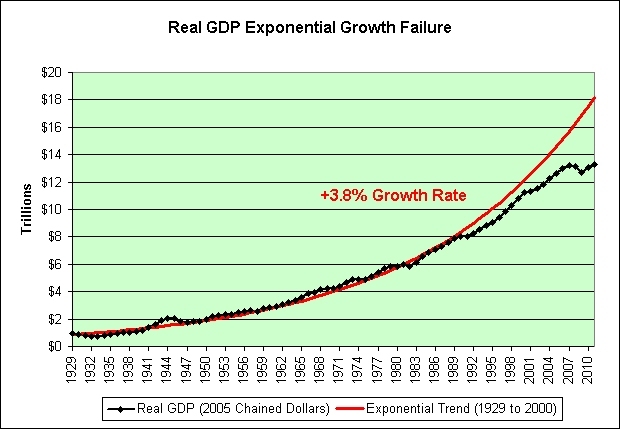 Perhaps the exponential trend line failures are merely temporary and are simply due to one-time events. Perhaps changes in the exchange rate will boost their future results. Perhaps they have grand plans for acquisitions. Perhaps they can convert their high grade AAA rating into a low grade BBB rating while simultaneously buying back a @#$%load of shares. Most investors seem to love that. 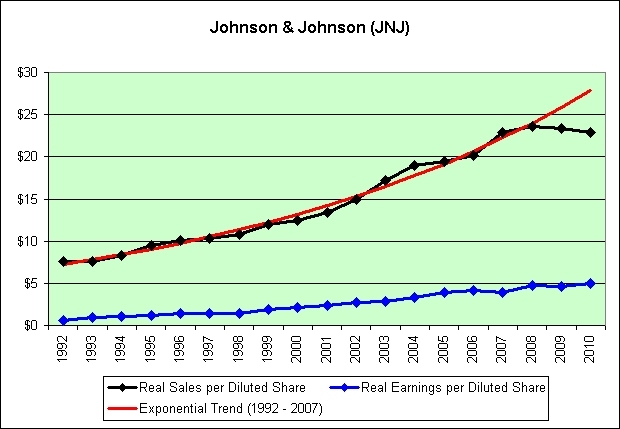 It would certainly boost both sales and earnings per share. I'm serious. All of those things are certainly possible. In any event, I shall pass and I am clearly in the minority. What are the odds that 96.5% of investors are wrong? The math would say 3.5%. I've got a feeling the odds are somewhat higher though. 5%? 10%? I am not at all tempted to short the stock but I would be tempted to short a herd (if given roughly 30-1 odds anyway). I want to be perfectly clear. I have not dug through the annual reports in detail. Please do not consider this limited research to be anything even remotely similar to due diligence. I can say this though. These charts do not inspire me to dig any deeper. I continue to climb 20 extra flights of stairs each and every day. The chart was flat this month. It has been my goal to be within the blue zone within the time frame of this chart and to do so with the least amount of effort possible. It's a long-term lazy person's approach. 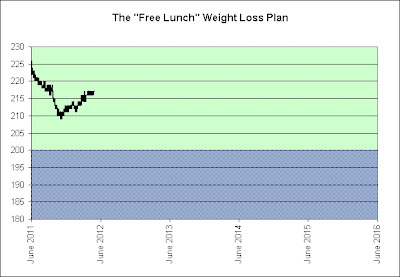 I've never actually tracked my weight over this long of a time period. I therefore don't yet know how strong the seasonal effects are. All I really know is that I am more active in the summer and tend to eat differently when it is hot. In theory, the seasonal effects should put me in tailwind mode for the next 6 months. The low point on the chart was hit around Halloween. June is where the real action begins. That's when I'll finally start to see year over year results. That data should therefore be entirely free of seasonal effects. 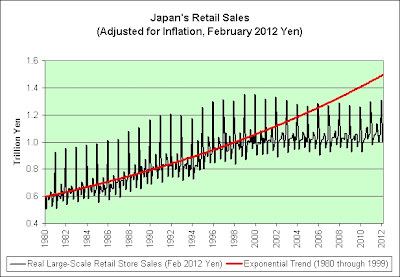 I suspect that the seasonal effects are strong, but probably not as strong as this chart implies. 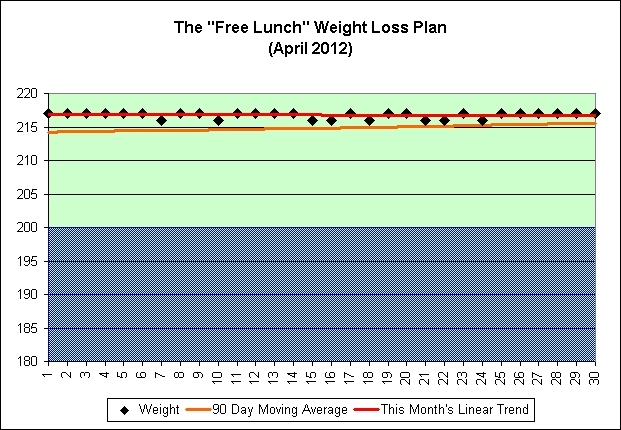 Some of the decline in the first few months could have easily been a subconscious desire to lose extra weight. 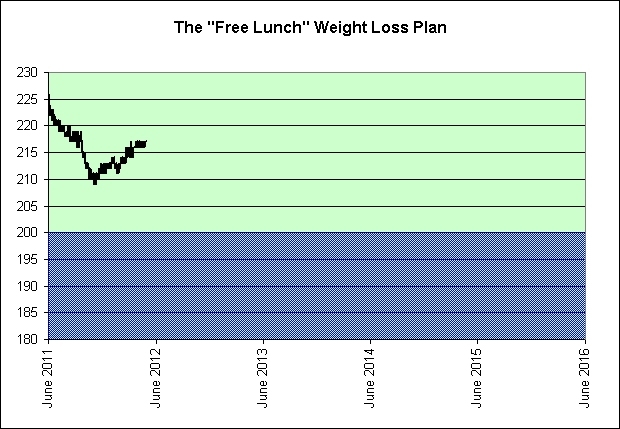 In the past, the first few pounds always seemed the easiest to lose. In any event, it is a permanent habit now. It does add up. Although it is just a few minutes per day, I can feel it in my legs. George Jetson: age 34, is a loving family man who always seems to make the wrong decision. He works "full-time," 9 hours a week, at Spacely's Sprockets as a computer engineer. Once financing becomes more available, he expects to see a “tsunami” of home sales as the pent-up demand is finally expressed. 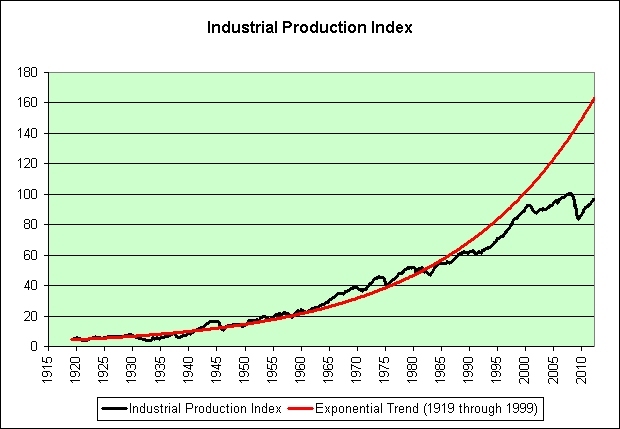 How Can Any Rational Person Be Optimistic about Our Long-Term Economic Future? 1. 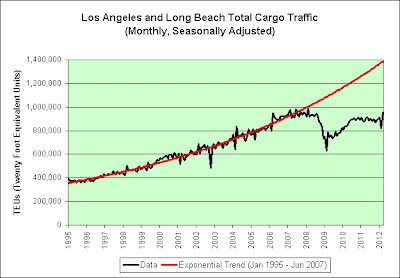 The exponential trend lines are based on the data from 1959 through 1999. 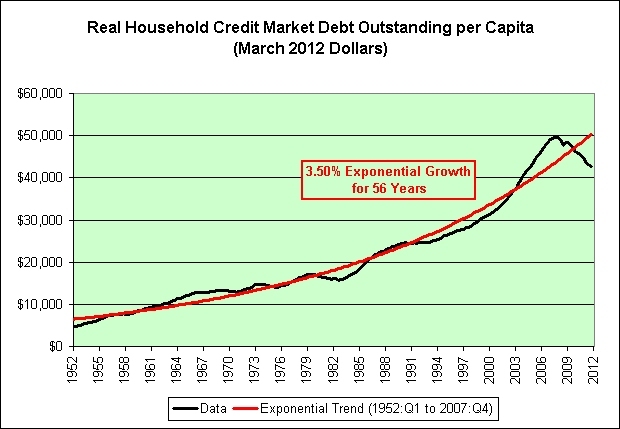 If that was our truly prosperous era, then why did we require exponentially increasing net government borrowing (relative to our wages)? 2. 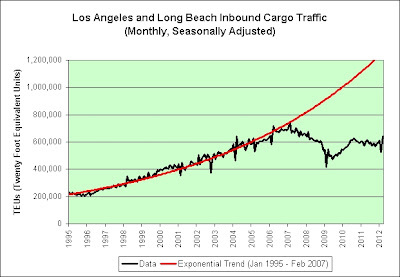 The long-term exponential trend for expenditures exceeds the long-term exponential trend for receipts. Who thinks that will end well? 3. We seem shocked that our government is spending so much. Should we be? 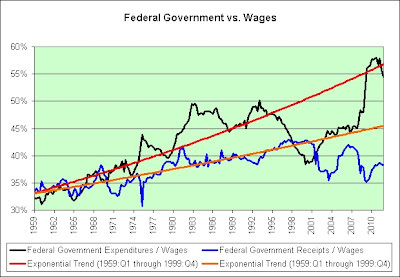 Current federal government expenditures (in black) sit right on the trend line (in red) that was established before our recent economic crises even began. 4. Who really thinks we'll be sitting pretty if federal government expenditures reach 100% of wage and salary disbursements someday? If these trends established between 1959 and 1999 continue then that would happen in the year 2067. There's no way we'd make it that far though. Things would clearly fall apart well before then. 5. 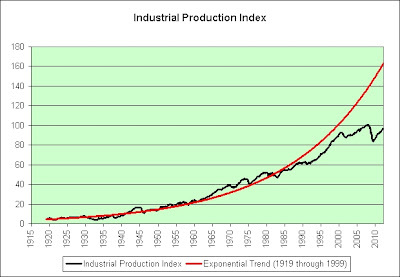 The last decade of economic calamity certainly hasn't made the trends any better. 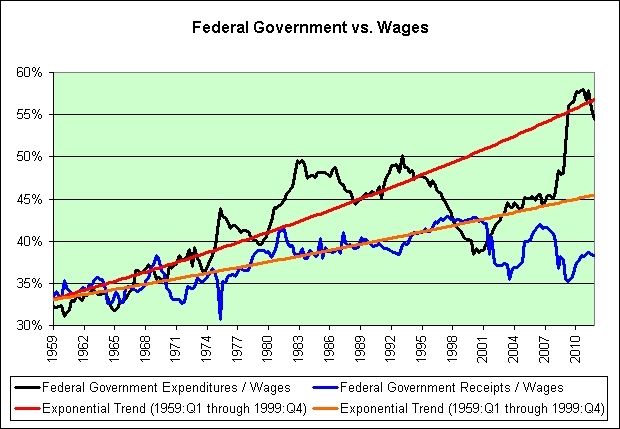 The exponential growth trend in federal government receipts has failed miserably. 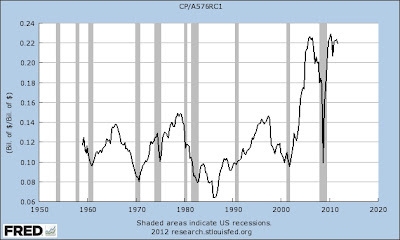 As a percentage of wage and salary disbursements, we're now at 1980 levels. 6. Dare I mention Social Security and Medicare? 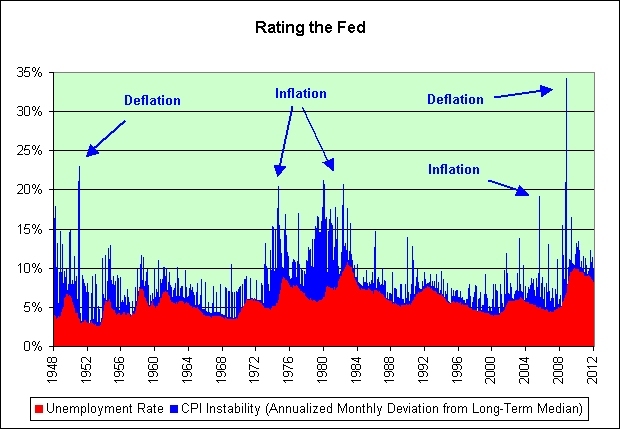 There are many ways the Fed could be rated. 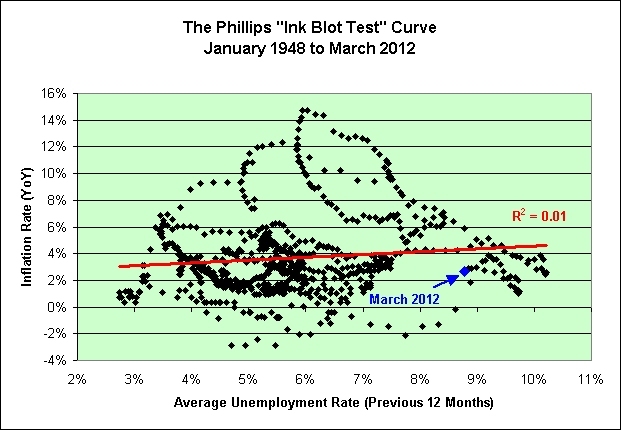 This is simply my attempt based on the dual mandate of maximum employment and price stability. 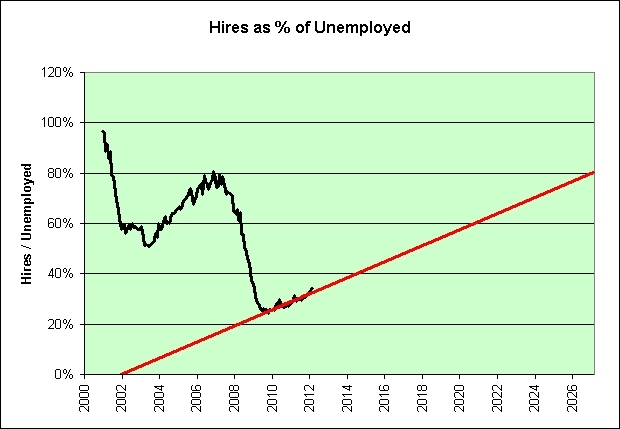 Start with the unemployment rate. That's the easy one. It's just the area in red. The less red the better. Now compare the amount the CPI changes in the given month to the typical amount the CPI changes in a month (the median change is roughly +0.26%), then annualize the difference. 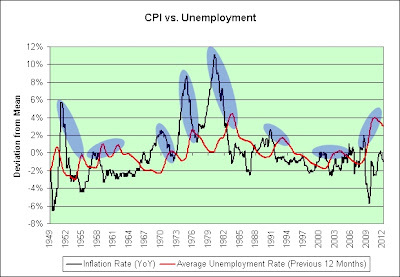 This is the blue CPI instability part of the chart. Stack it on top. For example, in November of 2008 the @#$% hit the fan. 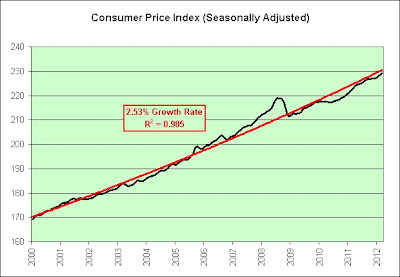 The CPI dropped 1.79% that month. 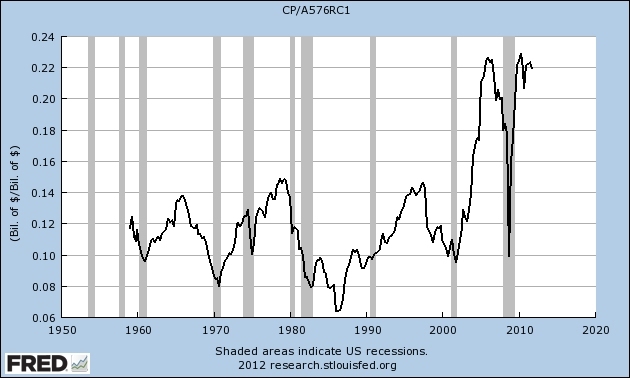 The CPI typically rises 0.26% per month (+3.2% annualized). The difference was therefore 2.05%. 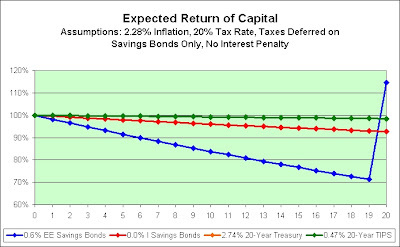 Annualized that's 27.6%. Oops! As far as my rating system is concerned, the goal for the Fed is to minimize the combination of the two. Needless to say, they haven't been doing great in recent years. 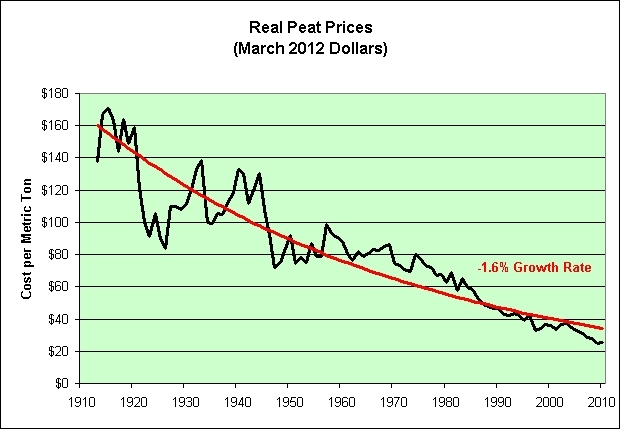 I should also point out that the Fed doesn't actually give us price stability. 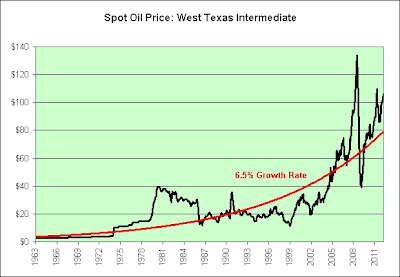 All we get, at least in theory, is price predictability. I'd settle for that if they can deliver. The last thing anyone needs right now is even more uncertainty and chaos. And lastly, as of January the Fed claims that their inflation target is now 2.0%. That works out to +0.17% per month. Seeing as how they've overshot the target in both February (+0.41%) and March (+0.29%), I think I'll stick with the median value until I see more evidence. Talk is cheap. Yesterday I posted the following 2 charts. 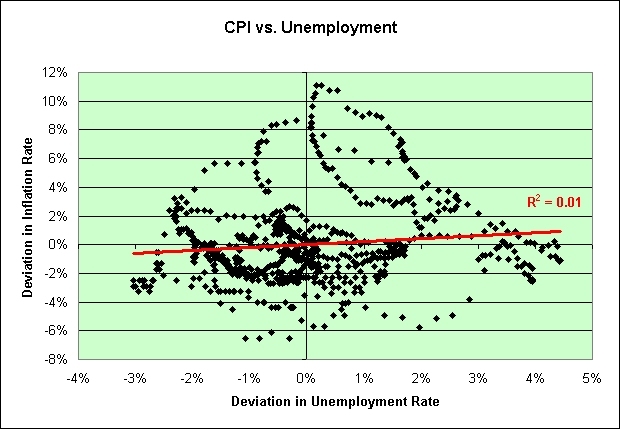 I pointed out there was no correlation between the rate of inflation and the unemployment rate. I stand by that claim. That's what the math shows. I figured out a way to create some correlation though. Let's go back to that first chart and annotate it. Here's my claim. 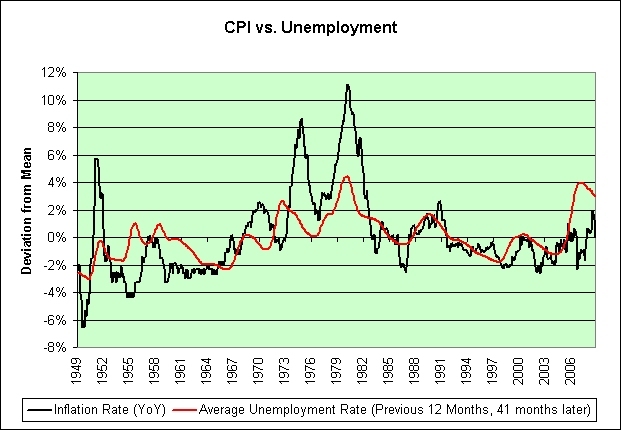 First the inflation hits, then the unemployment comes as the Fed is forced to fight it. I have circled the relevant pairs that would support this theory. As a side note, it would seem that the Fed didn't realize its own strength in the most recent fight. In hindsight, they whacked the @#$% out of it. Here's what the chart looks like when we offset unemployment by 41 months. 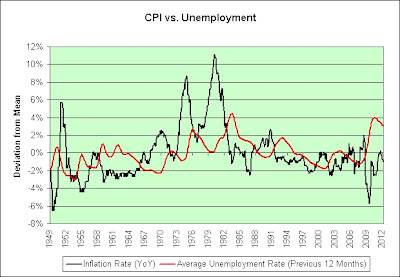 In other words, the inflation you see in the chart is paired with the unemployment rate that comes 41 months later. Why 41 months? 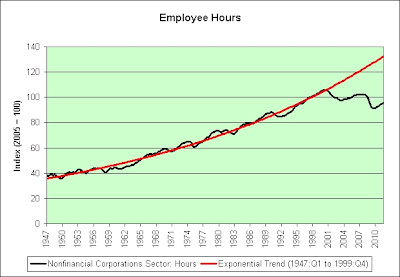 That's the time frame that gave the strongest correlation in the following chart. So what does this mean? It is my opinion that inflation is not a free lunch. If you want extra inflation now then you will pay for it roughly 41 months later (give or take), lest we run the risk of a currency crisis and/or hyperinflation. 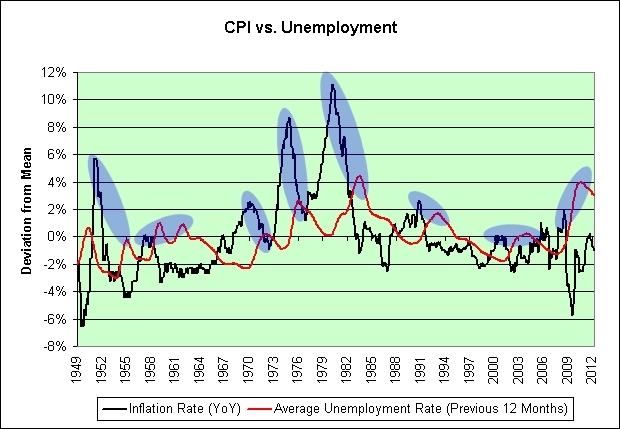 NBER WORKING PAPER SERIES: INFLATION TARGETING IN THE UNITED STATES? 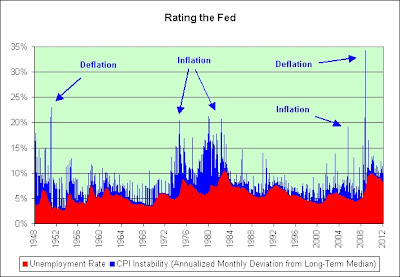 The Volcker disinflation made particularly clear why it is so costly to restore credibility for low inflation once it has been compromised. It was apparently not clear to Gregory Mankiw. He was perfectly willing to have the Fed destroy the credibility of US legal tender by drawing a number randomly from a hat. 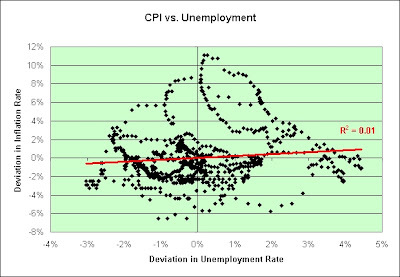 As seen in the chart, there is no correlation between the inflation rate and the unemployment rate. Here is an alternative way to look at this same data. 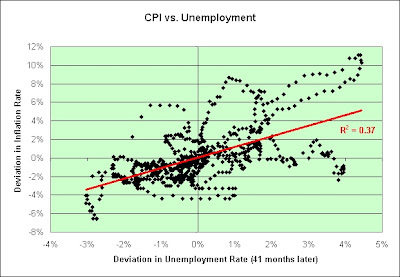 I'm plotting the inflation rate compared to the average inflation rate and the unemployment rate compared to the average unemployment rate. 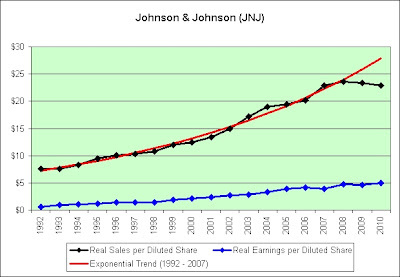 Do you see correlation in that chart? Maybe you do. How sure are you? Here's that same data plotted on a scatter chart. There is no correlation (neither positive nor negative). That's what the math says. Whatever pattern you think you see is undone by the patterns you don't see. 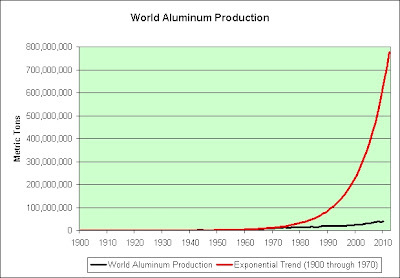 So many exponential trend failures. So little time. Speaking of unendurable, here's a two-year chart of Ford vs. GM. Yahoo Message Board: Ford...Is it really that bad?????? Lets see...They said once ford became investment grade the stock would soar....they said once F starting paying a dividend again it would skyrocket...they said once F shows earnings above the estimates and sales above the est that it would do nothing but soar. Well all of those things happened and the stock is down 38% from its highs and down 12% lower than 2 weeks ago. Can someone really tell me what the fk is going on. I am ready to bail on this so called great buy. I dont want to hear about Europe or bad management, the best I can tell Mulally has done an excellent job considering they took NO gov. money and recovered on their own. WASHINGTON (MarketWatch) — If the first-quarter gross domestic product report is an animal, then economists say it’s more a workhorse than a pony. All it took was a bit of magic. What would a reduction or elimination of silver content of our coins mean to you? The answer is that unless you're a coin collector or a hoarder, it would mean NOTHING. As for speculators, they should be fully aware that the Treasury is determined to hold silver's price where it is to prevent the melting down of existing coins for their silver content. Oh Silvia Porter! What were you thinking! The term has come to mean a highly promoted, often over-staged performance, presentation, or event designed to sway or convince opinion for political, or less often, commercial ends. Typically, the term is used to connote disdain, jocular lack of appreciation, or distrust of the message being presented or the efforts undertaken to present it. Police raided the peat-bog gang and confiscated 14 trucks, 19 pieces of construction equipment, two helicopters and a plane, Interior Ministry website said. Nobody ever claimed that the infamous peat-bog gang was there to make a killing. 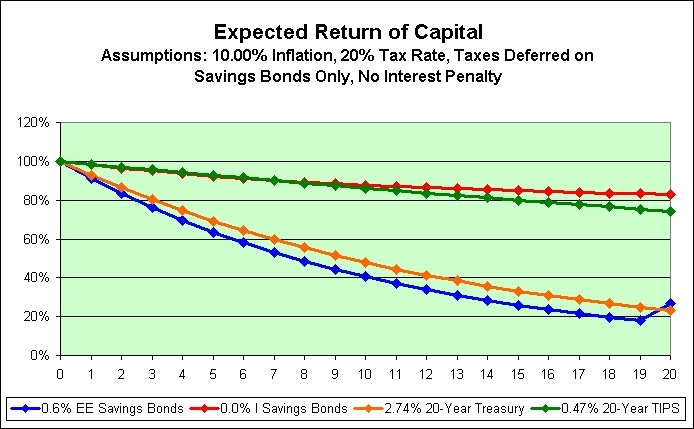 How Should I Safely Diversify to Beat Inflation? As you can imagine, I could not wait to hear the advice of a real life Ph.D., CFA, CFP! I immediately grabbed my checkbook as the excitement welled up within me. 1. He shot down federally insured bank accounts claiming that they won't do much to protect against inflation. Makes sense. 2. 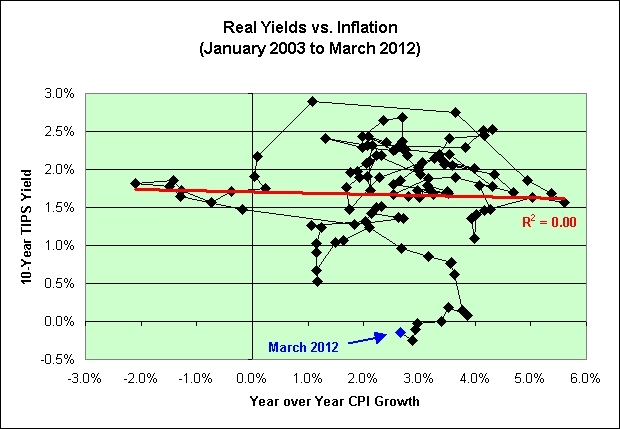 He shot down TIPS due to their negative real yields. As a holder of TIPS, I have no choice but agree with the math. It stinks. 3. He offered I-Bonds as a choice. Not sure how they can safely beat inflation with a 0.0% real rate and with the added pain of paying tax on any inflationary gains. But hey, it is the best choice so far. I'll give him that. Unfortunately, he got the $5,000 limit wrong. It's now $10,000. A glimmer of anti-hope (cynicism) formed in my brain. So guess what was offered as an alternative? Nothing. The article just sort of ended. It was at this point that I put down my checkbook and sighed in despair. The question of where to "safely" beat inflation will apparently continue to remain a mystery for both myself and the 79 year old reader looking to protect his principal. Or will it? The only way to safely beat inflation is to do absolutely nothing? In that case, I'm cashing out everything and investing in nothing. Paper dollars, shovels, and backyards for the win! Sherlock Holmes! You are a genius! This concludes today's sarcasm report. 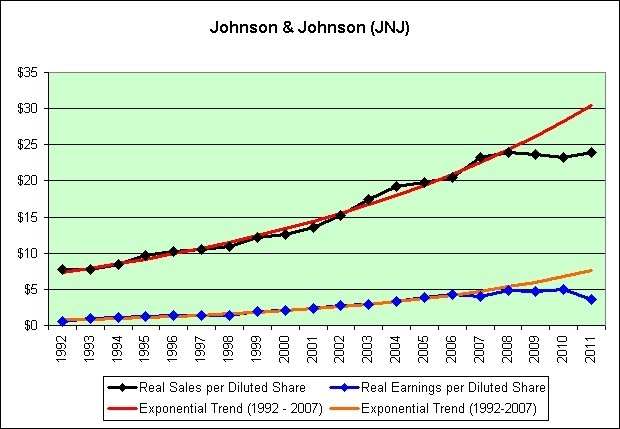 I offer two trend lines for your consideration. In the future, sales or transfers of metal by producers to their subsidiary or affiliated companies and even by one division of a single company to another will be subject to control by the director of priorities. It is clearly understood by the fabricators that their products will be subject to priorities also. Non-defense orders will be accepted on an "if and when" basis. It is questionable if defense orders will take up the capacity on some of the products of the fabricators, but getting copper for non-defense uses will be another matter. Even fabricators with defense orders are having their problems. 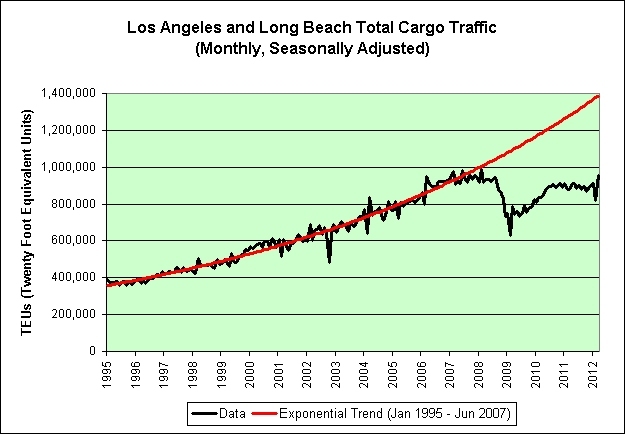 Exponential trend failure! Let's step back and see how bad it really is. Nasty! 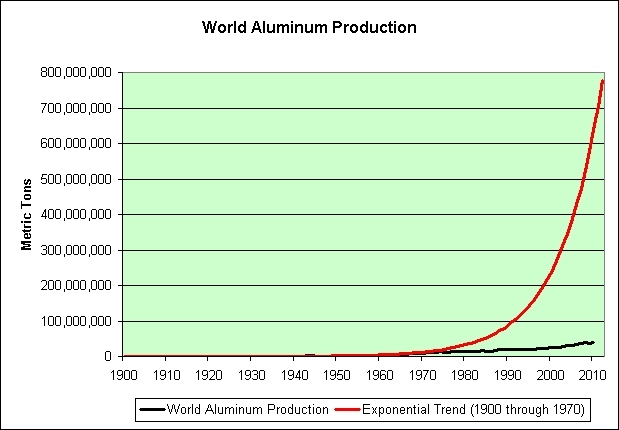 The aluminum speculators must have loved this break in the trend. 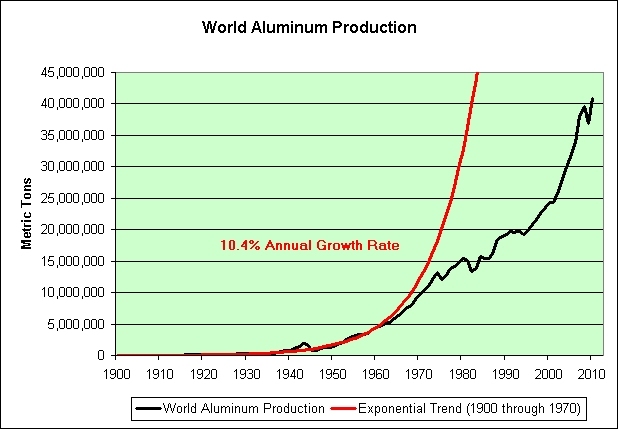 We're not growing global aluminum production anything like we once did. 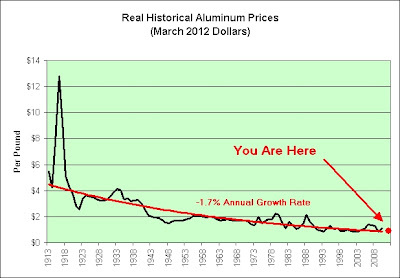 And as an added bonus, the Fed is doing all it can to support prices! Let's see how it is going. What? Aluminum prices haven't been keeping up with inflation? 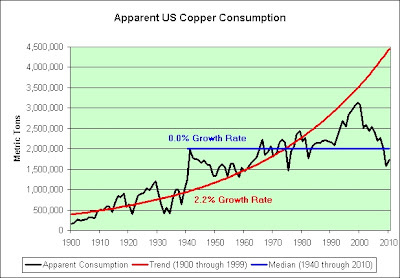 Just something to think about if you are long commodities and/or fear hyperinflation. The Fed might be creating money out of thin air but the mining companies have been plenty busy attempting to meet our nearly insatiable demand as well. Our demand apparently does have limits. 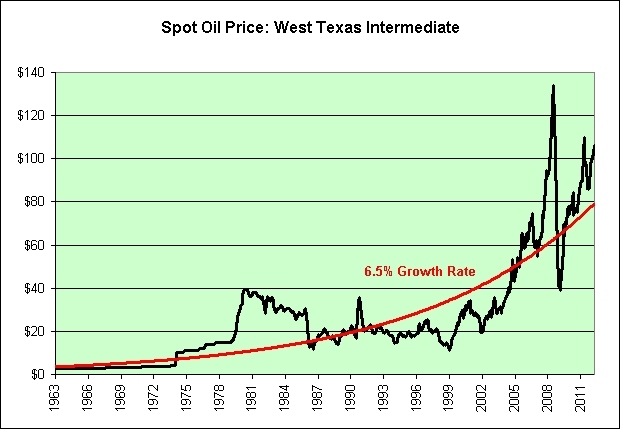 You probably won't hear this from a commodities trader these days though. 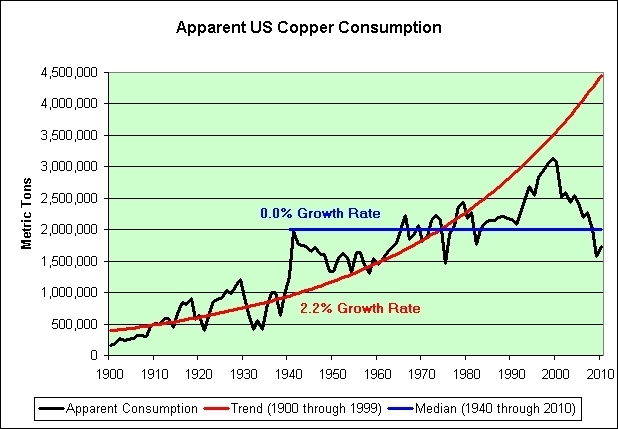 Investors have gone crazy for commodities, pouring money into everything from oil to copper. Just like the world's mania for tech stocks in the 1990s, this boom is headed for a bust. For what it is worth, I think it is a distinct possibility. I wouldn't bet the farm on this theory but I wouldn't rule it out either. There's also an issue of timing. When will it bust? You tell me and we'll both know. Perhaps it depends on China. 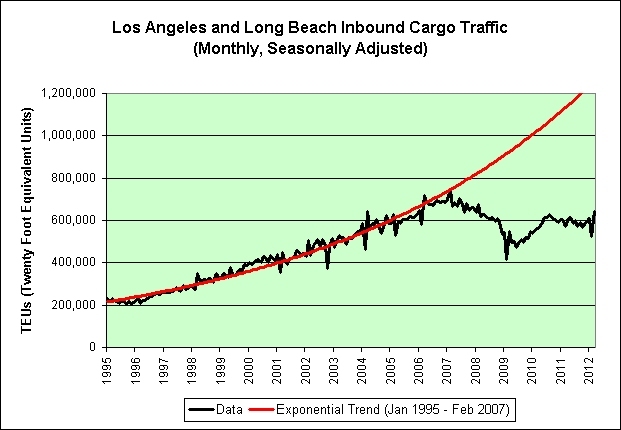 And the overcapacity isn't limited to real estate. Chinese industry has been churning out massive amounts of steel, cement, and aluminum -- so much that there are doubts about the economy's ability to absorb the output. The housing industry can be the “key engine of job growth” the country needs, says Bob Nielsen, chairman of the National Association of Home Builders. 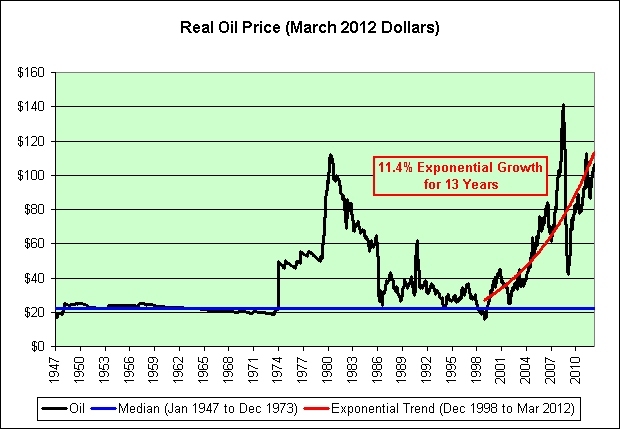 The 1973 "oil price shock", along with the 1973–1974 stock market crash, have been regarded as the first event since the Great Depression to have a persistent economic effect. If you had to pick just one method for determining whether or not a stock is cheap, the Price to Earnings, or P/E ratio, would have to be right at the top of the last. Earnings better not Freudian slip! But for Social Security to adjust, Congress must act. The plan's current math uses a return assumption that dates to 1983. 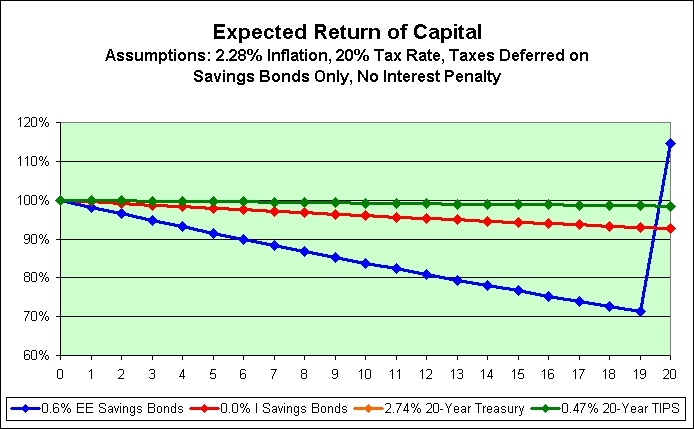 It assumes investors can easily find risk-free investments that pay 2.9% after inflation. Bullard said the committee’s January 2012 choice to publicize a target inflation of 2 percent was an important step toward maximizing employment and stabilizing prices to allow Americans to enjoy a comfortable balance between having enough money and the leisure time enjoy it. The chart does make one wonder if the previous inflation target was 2.5%. In any event, I'm in favor of the 2% inflation target. 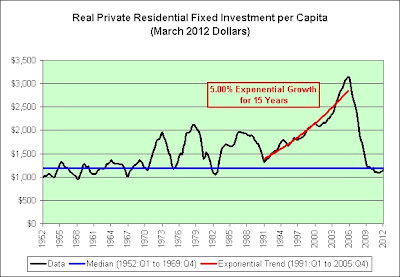 It won't miraculously generate more prosperity for us, but as a saver it is better than a sharp kick in the teeth. Kenneth Fisher, the billionaire investor who oversees $43 billion at Woodside, California-based Fisher Investments Inc, said the current economic environment was "as beautiful as I have ever seen it," and that 2012 would be "a super big year" for equities. Don't you see what this means? 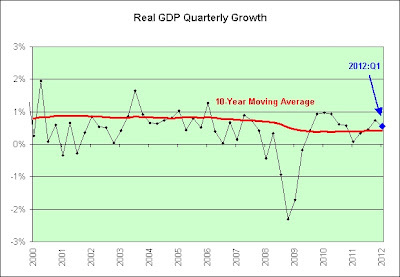 Even with an 8.2% unemployment rate and $100+ oil, the economy is at least as good as it was back in 2007! Shocking! 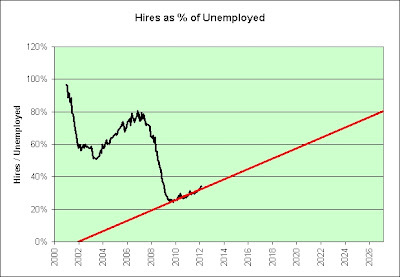 Other than a few fringe bloggers with little to no formal economics training, who could have possibly seen this exponential trend failure coming? Just look at it. It's as smooth as a baby's bottom! 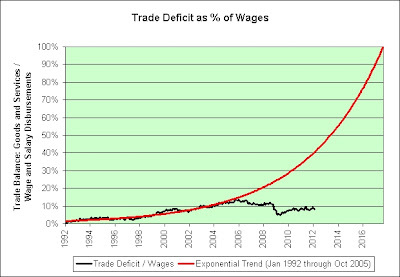 So what if 100% means we'd be shipping every penny of every paycheck overseas (with nothing left to eat or pay taxes)? As seen in the chart, that wasn't supposed to happen until 2017. This is only 2012! 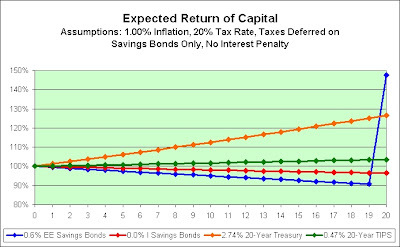 I'm using the bond market's 20-year TIPS to nominal treasury spread to estimate the expected inflation rate. 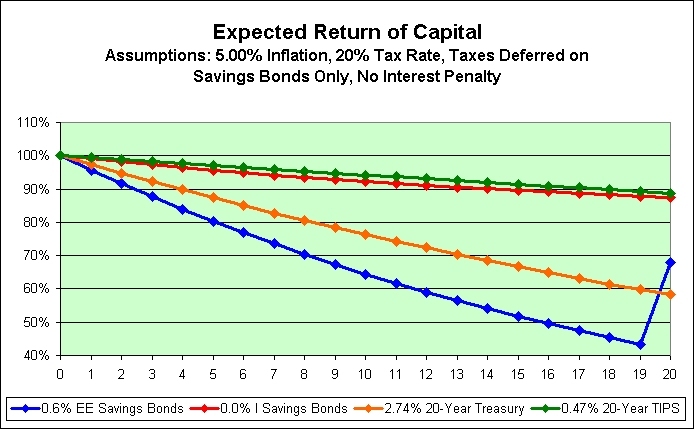 You cannot see the 20-year treasury in this particular chart because the 20-year TIPS exactly covers it up. 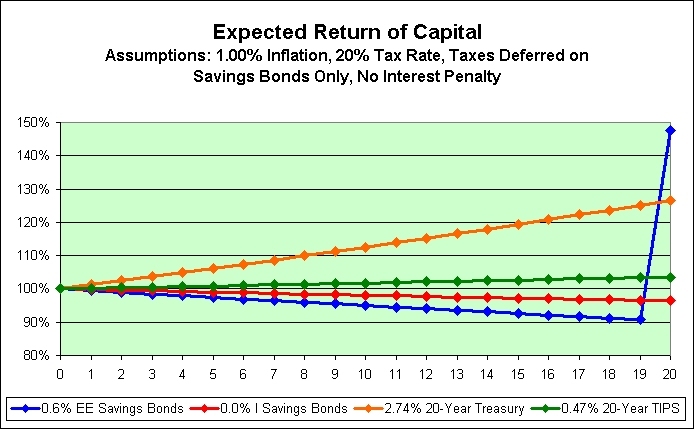 The EE Savings Bonds offered today are guaranteed to double in price in 20 years. You can see that in the chart. The 2.28% inflation rate is not locked in stone. 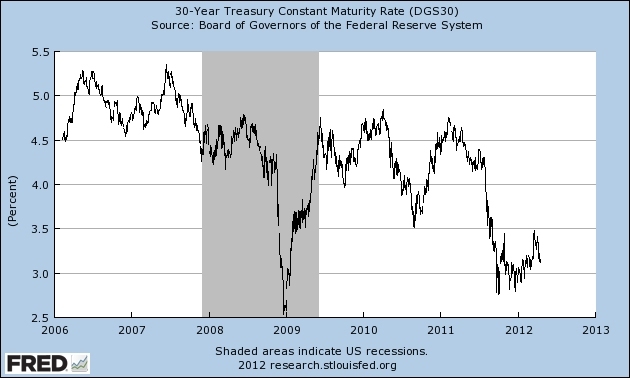 In other words, the bond market could be wrong and most likely is. Here's what happens at 1%. Here's what happens at 5%. Here's what happens at 10%. I'm not predicting 10% inflation. I own inflation protected bonds as insurance. Similarly, I don't think my house will burn but I do have fire insurance. 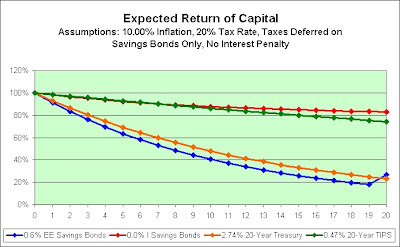 Also note that owners of inflation protected bonds should not root for more inflation. 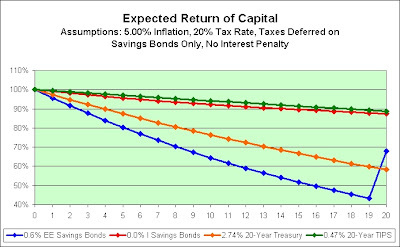 The higher inflation goes, the less capital is protected (due to the taxation on the inflationary gains). This post inspired by Troy who brought up return of capital in a recent comment. 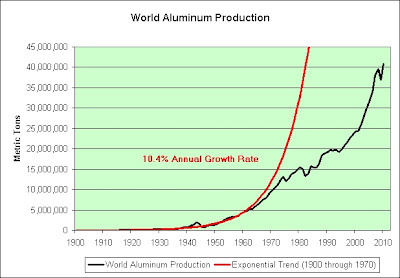 China has "already got overcapacity that's about equivalent to the size of the entire German market," said Mr. Thomson. China will certainly be the largest producer and consumer of automobiles in the next several years. I don’t know how much they will produce or consume. I've never seen a more uncertain certainty argument. 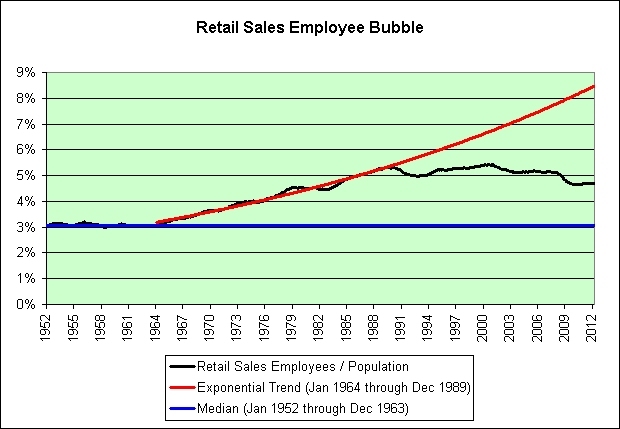 But if anybody thinks there’s a bubble in China, they haven’t been doing their homework. The bubble popped. Prices have come down and are continuing to come down. There was this bubble you see. And it popped. But don't go calling it a bubble now because prices have come down and they are apparently continuing to come down, lol. 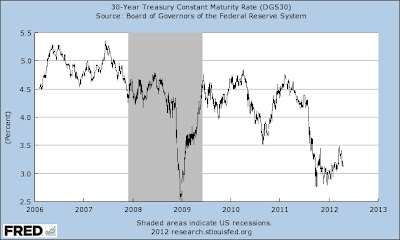 I shorted Treasury bonds again a little while ago, and my timing has never been very good in that market. I’m down a little bit, not much. Jim Rogers, the noted commodity bull, is shorting the 30-year U.S. government bonds and may consider shorting the 5 and 10-year bonds as well, he told CNBC on Monday. For those keeping track at home, that's a 1.25% loss each year for 30 years. He managed to squeeze all of that "sure thing" pain into just 9 months though, much like an expectant mother. Please see "Figure 5 - When to Buy TIPS" from within the link. I'm attempting to recreate the theoretical table with actual historical data. 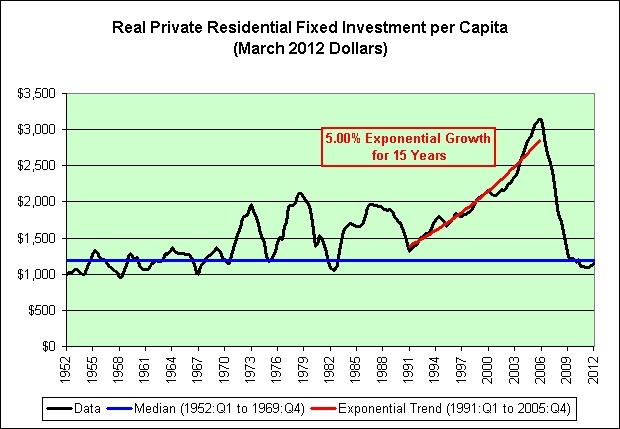 Growth rates are year over year. This is not a sales pitch for TIPS. 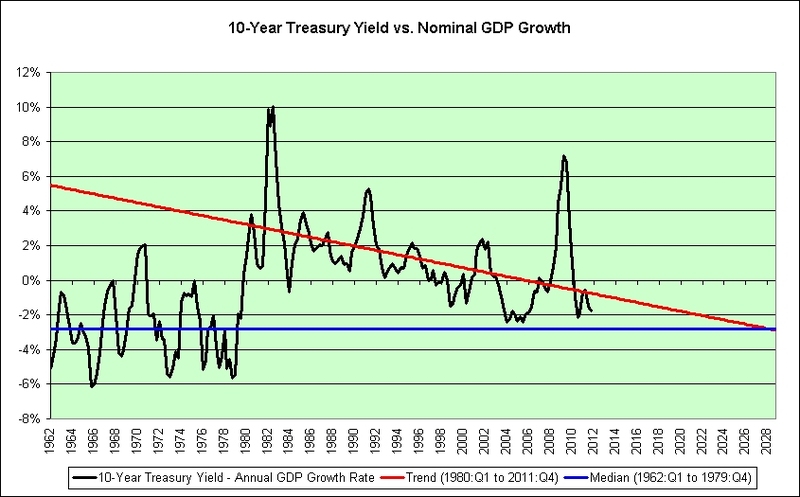 I'm simply trying to show why both TIPS and nominal treasuries have done well over the past decade. 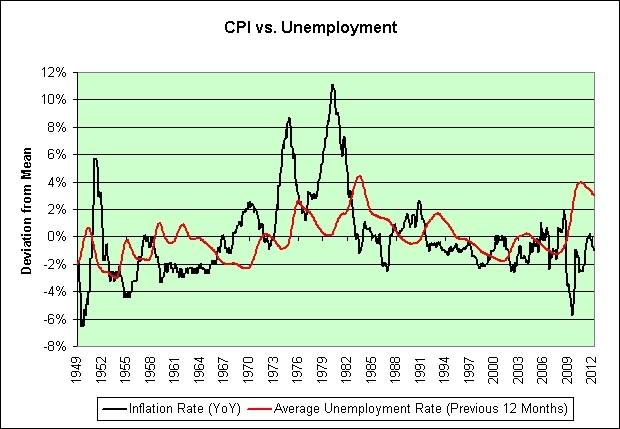 We've been toggling back and forth between Stagflation: BUY and Recession Disinflation: Monetary Policy Drives Call. What happens in the future will depend on where new blue diamonds appear within the chart. Based on my blog's name, you might guess that I'm not betting on the "miracle" quadrant. I offer this outstanding news for those who hoarded the same toilet paper that I did. 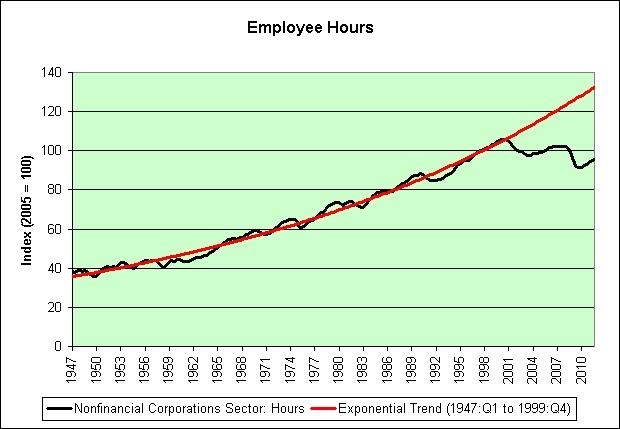 We no longer need to worry about productivity miracles making our hoards seem silly. See that toilet paper hoard off to the right? That's Georgia Pacific's Marathon brand purchased at Costco. A recent purchase was accidentally opened by my girlfriend. We normally use oldest first. That did allow me to compare the newest rolls to our oldest rolls. The rolls were slightly different sizes (which I knew) but something felt wrong about the actual sheets. I felt a bit like the Princess in The Princess and the Pea. I therefore decided to take two rolls to the kitchen scale. The new package has 4.0" x 4.5" sheets. The old package has 4.0" x 4.5" sheets. The new package has 48 rolls at 470 sheets each. The old package has 45 rolls at 500 sheets each. The new roll weighs 174 grams and has 470 sheets. The old roll weighs 200 grams and has 500 sheets. The cardboard tube weighs 5 grams. The new sheets therefore weigh 0.36 grams each (169 / 470). The old sheets therefore weigh 0.39 grams each (195 / 500). Very clever. I seem to be getting about 8% less toilet paper per sheet and nobody is the wiser. Well, that's not quite true. At least one person is the wiser now and if he tells two friends, and if they tell two friends, and so on, and so on, then perhaps nearly everyone can be the wiser. In any event, I would argue that the majority of my toilet paper hoard just went up in value by about 8%. Woohoo! I feel so much richer now! Find the Total Square Feet number on the package. Then divide it into the price that the package costs. The weight of each sheet should also be factored in apparently, unless of course you would enjoy watching TV through a sheet of 2-ply toilet paper someday, lol. Sigh. 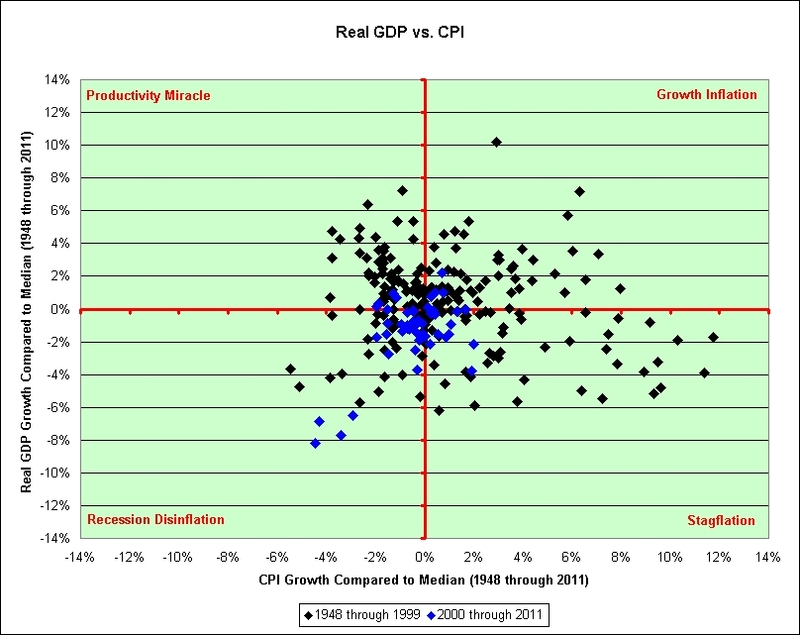 The Illusion of Prosperity is alive and well. Good times. Spain has reassured us all that any adjustment is ridiculous, unthinkable, completely out of the question, that they have one of the most efficient financial systems in the world, and that it is immensely solid as well. Why worry? Quick! Someone find me an optimist. I'm looking to place a bet! We will never see 80% again. That's right. 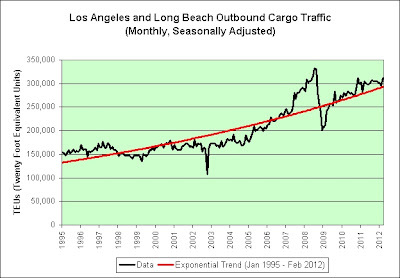 I don't have any long-term faith in my own trend line. Oh the humanity! I could be wrong of course. 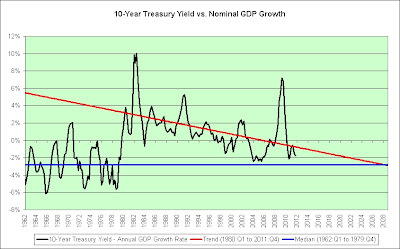 Perhaps the economy is so strong that we can go 15 more years without a recession? 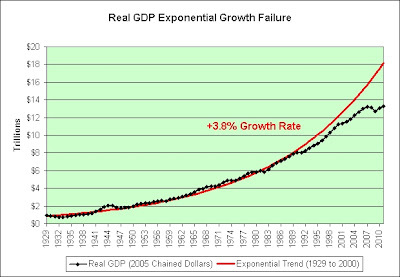 In an effort to keep the exponential trend in exponential trend failure charts alive, I present you with the following chart. Sony, Panasonic and Sharp — Japan’s three main TV manufacturers — are expected to have lost $21 billion between them in the fiscal year that ended March 31, partly because of Korean competition. Many of the Japanese engineers finding a second life in China do not have the expertise in cutting-edge technology that would deal another crushing blow to Japanese manufacturers, analysts say, but the long-term impact could be severe because they will give Chinese manufacturers the skills to make high-quality goods efficiently. 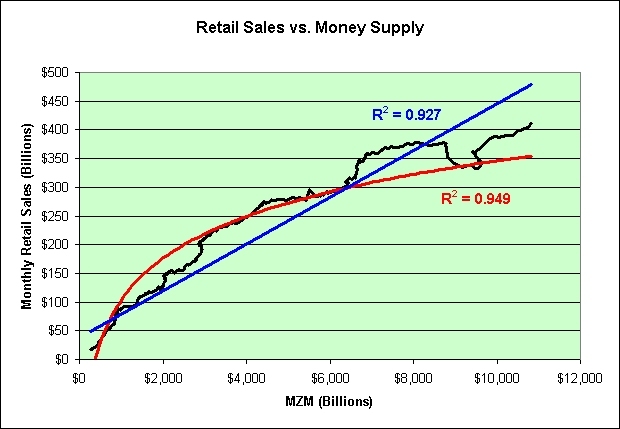 The linear trend line in blue is for those who think the growth in the money supply should have a direct effect on the growth in retail sales. One might call this group the optimists. 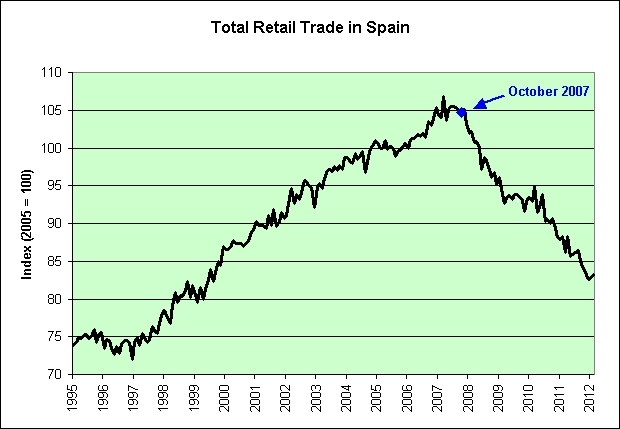 They hope for a return to the blue trend line and all will be well when it does. 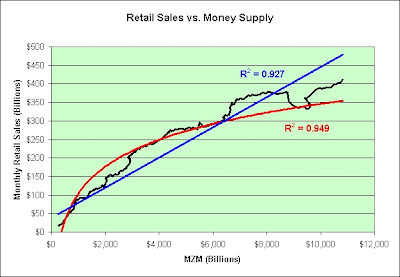 The logarithmic trend line in red is for those who think the growth in the money supply is having a diminishing "bang for the buck" effect on the growth in retail sales. One might call this group the pessimists. 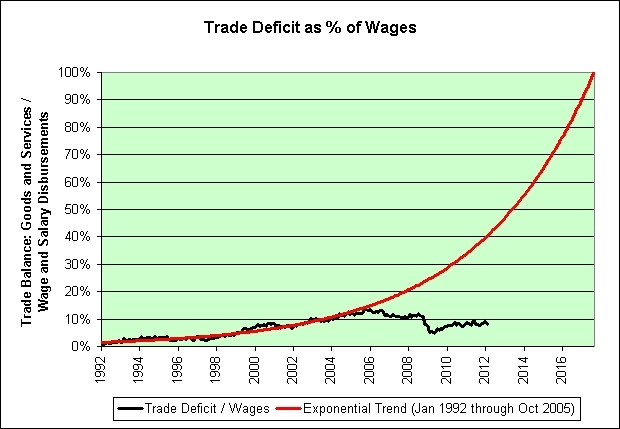 They brace for a return to the red trend line and all will fall apart when it does. 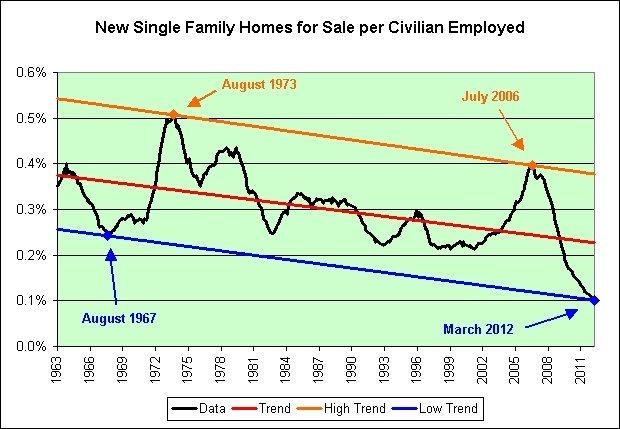 Based on the correlation seen in the trend lines, I'd say the pessimists have the stronger case. I am between the two camps, with a decidedly pessimistic bias. 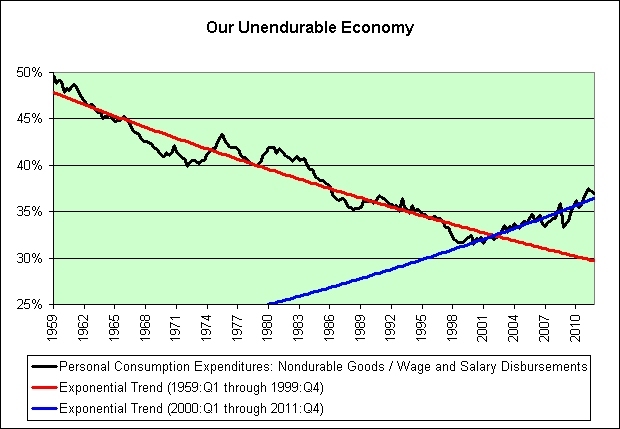 I do not think the Fed has permanently removed the possibility of recessions. I would also not want to be an optimist when the next one hits (whenever that is). And lastly, there's one group left. 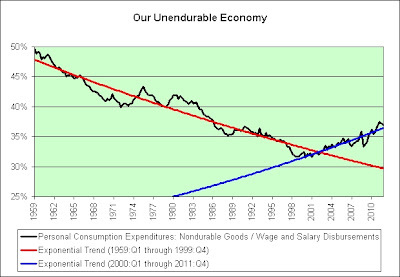 The hyperinflationists seem to think that not only will we make it back to the blue trend line but we will surpass it with great abundance. 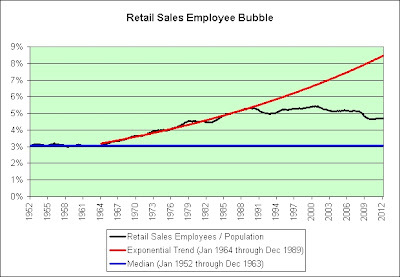 $10 trillion in monthly retail sales here we come! And when might this happen? If history is a guide, it is *always* a few months away. You just need to be extremely patient! In the past, I have claimed that owning TIPS allows me to be somewhat of an inflation agnostic. I now have a chart to back the theory. Note that there is *no* correlation between 10-year TIPS real yields and what inflation has done over the previous year. In my opinion, the story of falling real yields has nothing to do with inflation and everything to do with a long standing theory of mine. It will be harder and harder to make easy money off of money. That's what the chart shows. 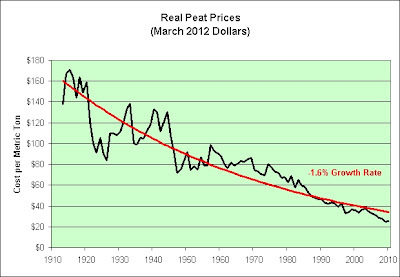 We can try deflation again if we like. We can opt for more inflation too. In the long run, it will not matter. Call me an economic cynic. They believed that the world belonged equally to everyone, and that suffering was caused by false judgments of what was valuable and by the worthless customs and conventions which surrounded society. There's certainly been plenty of suffering in the last decade based on what people thought was valuable. In sharp contrast, and as accurately portrayed in the following picture, I honestly believe that the best things in life are free (or nearly free). There's a story behind our dog Honey. I don't think I've shared it before. Some people went to an animal shelter and picked out a new dog. They brought it home. Unfortunately, the dog was pregnant and nobody realized it. Upon giving birth to the oddest assortment of puppies one would ever see (multiple fathers? ), they called the animal shelter and asked what they should do with the puppies. They were told that it wouldn't be a problem. Just bring the puppies back. How could the puppies be separated from the mother that soon? Once again, not a problem. The puppies would be euthanized. Needless to say, we ended up with a free puppy (and the other puppies found homes too). Honey's about 8 years old now. As for the couch, it is now in our kitchen and has quite a few claw marks on it. Contrary to "worthless customs and conventions" of most humans, our dog still finds value in it (and we do too apparently). Before you get out the party hats, some perspective is probably in order. Last month was very bad. So on that note, here's the fresh data. 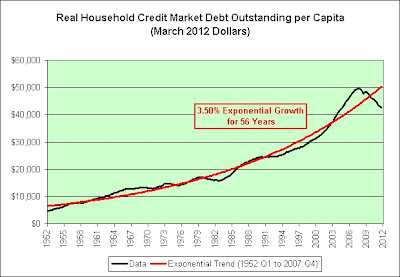 Note how far away from the exponential trend line we are. There is no hope of getting back to it. 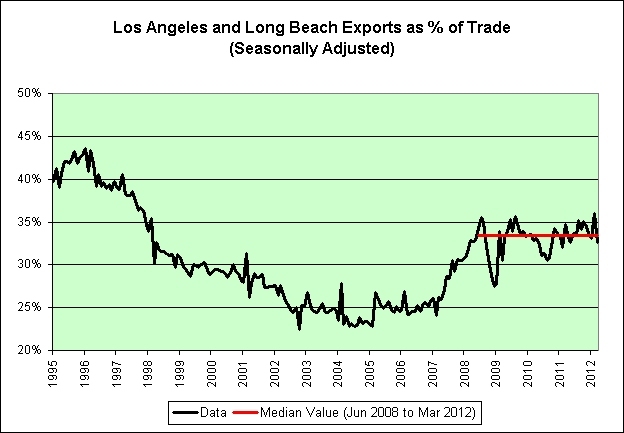 On the one hand, exports are looking good. 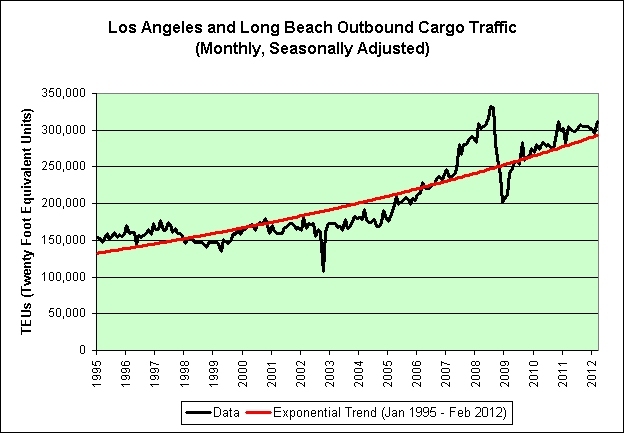 On the other hand, look at the collapse in total port traffic relative to the trend. And on that third hand, we continue to ship one loaded container for every two loaded containers we receive. 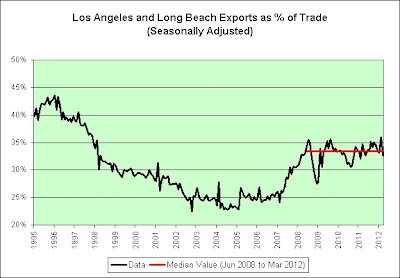 So how good can exports really be? Over the long-term, this can't end well.